In an area that was once a district of speakeasies and brothels, John D. Rockefeller Jr. took advantage of a depressed real estate market in the 1920's and built the largest privately owned business and entertainment center of the pre-war period. Completed in 1940, the project employed thousands of engineers, laborers and artists throughout the Great Depression. 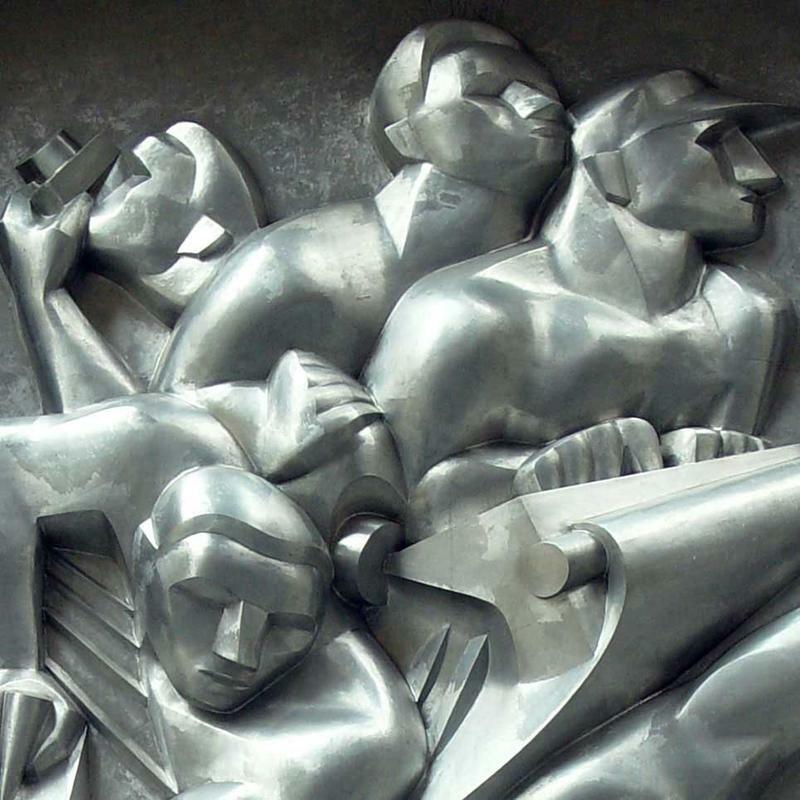 Influenced by the tastes and trends of the 1930's, Rockefeller Center is now a veritable storehouse of Art Deco murals, sculptures, mosaics and bas relief carvings signifying man's development in sprit, science and industry. 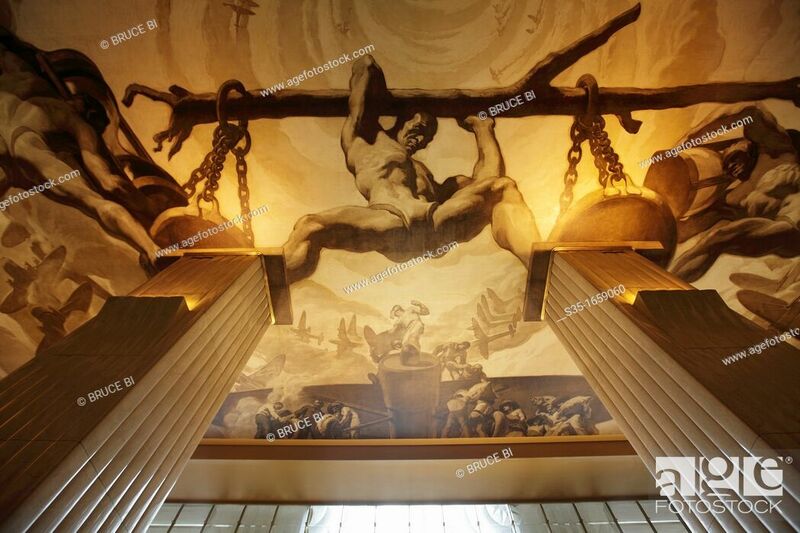 Many of the works have become icons of NYC: Prometheus above the skating rink, the sculptures along the promenades, and Atlas holding the world on his shoulders, to name a few. But there are hundreds of other works both inside and outside the building that run from 48th to 51st Streets and from 5th to 6th Avenues. The lobbies of the numerous buildings will provide plenty of sketching opportunities. Weather permitting we might even be able to do some work on the plazas. 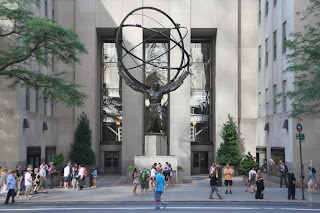 We will meet in the lobby of 636 5th Ave, behind the Atlas Statue. We can sketch the murals in the lobby and the waiting area above the lobby, and then move on to other locations. Or, feel free to wander the complex and sketch at your leisure then meet us for lunch. We will break for lunch at 12:30 and meet in the food hall on the lower level where we will have views of the skating rink. Bring something with you or purchase it from the many vendors in the food hall. Please note: stools may or may not be permitted and be prepared to work with dry materials. Note: We will meet in the lobby of the building behind the Atlas Statue. TRANSPORTATION: Almost all subway lines come into the area. Please check a map for your best option. Please RSVP directly to Raylie Dunkel at raylie@verizon.net. Looking for us? Text or call Raylie at 201-978-6387. Please note that phone reception might be difficult underground. If you are coming later and can't find us, meet us for lunch.